Many New Zealand forests are sprinkled with white at this time of the year. The indigenous Clematis are flowering, and particularly striking with its large white flowers is Clematis paniculata (puawhananga, white clematis). Close up of a male flower of Clematis paniculata. Copyright Leon Perrie. There is a plant of Clematis paniculata flowering wonderfully at present in Te Papa’s Bush City, at the harbour-end of the upper level. Most Clematis (variously pronounced “Clem-a-tis” or “Clee-may-tis”) are climbing vines that are rooted in the ground but whose leaves and flowers are held in the canopy. Rather than having female and male parts in the same flower, most New Zealand Clematis have separate female and male plants. Indigenous Clematis shouldn’t be confused with the introduced Clematis vitalba (old man’s beard), which is from Europe and Asia. 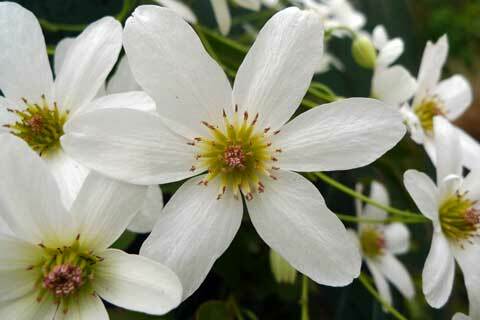 Clematis vitalba vigorously smothers forest it invades, causing canopy collapse. It is a pest plant targeted by many councils. Clematis vitalba flowers during summer and autumn, and is easily distinguished by its five leaflets compared to the three leaflets of the similar, indigenous New Zealand Clematis. This particular icing sugar shouldn’t be a problem for you. With such big flowers, I’m picking that Clematis is insect-pollinated, when it is really plants with wind-dispersed pollen that give us allergy-sufferers the most grief. These websites might be useful: http://www.allergyclinic.co.nz/guides/26.html and http://www.allergy.org.nz/site/allergynz/files/Annual%20Pollen%20Calendar.pdf. While they list some preventative measures, short of not breathing, it is difficult to avoid wind-borne pollen.